Budweiser Salutes Armed Forces 150. Sometimes life and racing can be similar to a fairy tale. Then again, sometimes fairy tales never come true. It took a while for Cinderella to find her glass slipper in her tale. 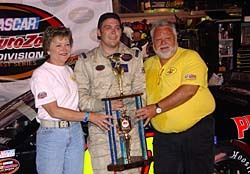 In the tale of Dusty Williams’ NASCAR Southeast Series career, it took even longer. After three long years of anguish and disappointment, it was finally Williams’s time to dance at the big ball. “This means the most of anything I've ever done in racing,” said an emotional Williams after his first win, which came during Saturday night’s 150-lap event at South Boston Speedway in Virginia. You couldn't have written a better story. The underdog team and underdog driver wins his first pole and his first career Southeast Series race. He passed NASCAR Midwest Series champ and the winner of the previous Southeast race Justin Diercks to take the lead a third of the way through the event. 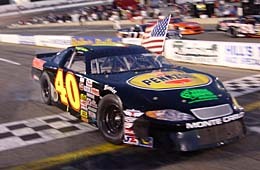 Then he held off last year’s SES champ Jeff Fultz with a green-white checker finish to accomplish the feat. “There are two people I wouldn't want on a green white checker behind me and that is Hogan (Jason) and Fultz because they can both be real aggressive,” said Williams. “They never touched me. All I had to do was keep it fast and on the track and they couldn't keep up. “In qualifying I wasn't really expecting to click off the lap we did. What was even more ironic about this well written plot is that William's #40 car found glory in his 40th career start in the Series. Williams was obviously pumped when he took the American Flag for a burnout victory lap for the big Memorial Day weekend win. 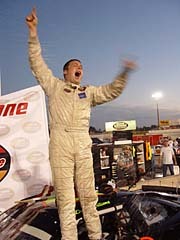 The celebration then exploded in victory lane. “Man that was great. The American Flag and the holiday weekend mean a lot. The 40th thing I didn't even know until I got to victory lane. As for the celebration, we fired it up. I saw John Craig (crewmember) coming across the track with that cooler and I knew where it was going. I said 'bring it on baby'. After three years of struggling in the series, the 2005 chapter of this story has put a big smile on Dusty's face. 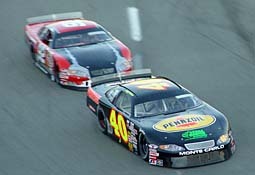 The Dixie Racing #40 Team has already had some strong showings and seems to be heading in the right direction. “In Houston, when I took the lead, I held it for about 60-laps. I got real emotional and overwhelmed to be in the lead. Tonight, to hold on to the lead for a commanding part of the race, I can't believe it really. And Williams points out that it was a chance encounter that may be the reason his family owned team has turned the page. With the new crew chief in place, the balance of work and play has been made easier for Dusty. But it was only a few years ago that Dusty didn't think he was going anywhere at all. The clock was about to strike midnight on Dusty's fable. He had virtually hit rock bottom in his racing career. After three years of blood sweat and tears, Dusty had given up on his dream of succeeding in the sport. 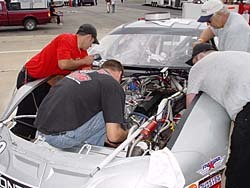 But faith and family saw him through his hardships and created the scenario for his Cinderella win at South Boston. “I believe in God. I've been truly blessed. You have to know you are doing the right thing in life. Towards the end of last year I didn't think I was in the right thing. I was set to go home and work in the family business, playing in the dirt and digging ditches for the rest of my life. I came to that conclusion and was at peace with it I thought. “As of January we weren't racing. The cars never even got unloaded from California. Then it just snowballed and things just got going so quick. It's kind of scary knowing I was that close to quitting. And it was the support of family and friends that made Dusty rise from the ashes. Hugging his parents in victory lane and sharing the win with all of those whom supported him made the wait for the win worth while. “The biggest thing is how my parents supported me,” said an emotional Williams of his family-run team. “Only a parent could really support me through things the way they have been. They are loving parents that never gave up and always believed that I could do it. It may have taken Williams 40 races and a lot of hard times before the glass slipper fit, but if you ask Dusty, he wouldn't trade the journey for anything. The win proved to Williams that fairy tales can come true and it happened to him.